What do count as valuable pieces of architecture? Only high-tech buildings, that are also very photogenic? Can we compare a simple wooden bridge to an investment worth millions of euros? In the end what is more difficult: to build an edifice or a community? Many questions, that all have the answer in the little wooden bridge at the Kőzúgó waterfall of Gyergyócsomafalva/Ciumani. The young architects that have built the bridge received the special prize of the Hungary Media Architecture Prize 2018. The edifice was in competition with modern buildings and gave a lesson to the jury and the audience that was present at the Budapest event. 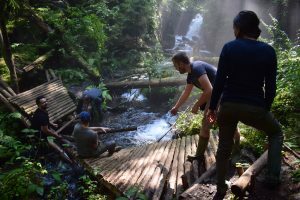 A couple of years ago twelve students of the Budapest University of Technology answered the call of Norbert Szilágyi and arrived to Csomafalva to build a structure that would facilitate the view of the beautiful Kőzúgó Waterfall. Due to the steep incline, the waterfall could previously be admired only by climbing on three fallen tree trunks laying on each other, or by crossing through the ice-cold water of the mountain creek. The purpose of the project also was to revive and demonstrate to the young generations the beautiful Szekler tradition of voluntary co-operative work (kaláka). The designers of the project, Árpád Bíró, Károly Lehel Kovács, Mercédesz Erika Nagy, Norbert Szilágyi, Kristóf István Szökő made the plan based on the portrayal of the location in a book well-known to all Hungarians living in Transylvania, Orbán Balázs’s The Description of Szeklerland. (A Székelyföld leírása). 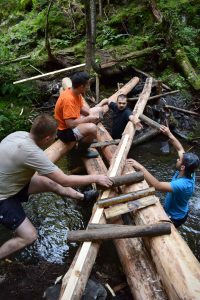 The resultz of the four-day-work is a wooden bridge, with the concept design resembling to the intersecting fallen trees over the creek also depicted by Orbán Balázs.The bridge thus came to be an integral part of its environment. During the construction a trickling spring was found amongst some rocks, underneath a nearby tree. Since then it has served as refreshment to the visitors of the Kőzúgó Waterfall. The story carried on, the locals cared deeply about Kőzúgó and its surroundings. The voluntary work influenced the residents; thus, they finished the steps heading towards the bridge, moreover, a resting place was also built near the waterfall. The designers think of the bridge as a symbolic structure, that connected two groups of people: locals from Hungary and Szeklers studying in Hungary, and also two countries: Hungary and Transylvania, Budapest and Gyergyócsomafalva. “We had multiple aims with the project, but the most important was to revive the traditions of kaláka, (voluntary co-operative work), forgotten in our materialistic world. Nevertheless, we wanted to drew attention to the fact that it is possible to create something substantial in small steps.” – Norbert Szilágyi, the mastermind of the project noted.